Walk into most new or remodeled homes these days, and you’re guaranteed to find at least one or two — if not an entire kitchen full of — stainless steel appliances. From the sink and oven to the refrigerator and dishwasher, even the microwave and toaster, stainless steel is the trendy, shiny, modern appliance material du jour. Stainless steel isn’t a single metal but rather an alloy, a mixture of specific metals. Steel scrap is melted and blended with metals such as chromium or nickel, heated, pressurized and finally treated to give stainless steel its defining characteristics. Stainless steel is somewhat of a wonder material, featuring amazing properties that have manufacturers using it for everything from silverware to large industrial projects. Stainless steel is corrosive-resistant (doesn’t rust easily), easy to produce, heat-resistant and completely recyclable. You’ve embraced your beautiful stainless steel kitchen, pesky handprints and all. No worries, though — stainless steel can be cleaned frequently without damage. What you do have to be careful about, however, is scratching the metal. This is when maintaining stainless steel can be a rather tricky chore. Stainless steel can be wiped down with plain water, a vinegar-and-water blend or special cleansers that help keep the metal’s luster (which beautifully highlights all those fingerprints!). But what happens when your appliance’s perfect sheen gets an unsightly scratch? Stainless steel comes in various grades and finishes, and home-grade stainless steel is usually the norm for all appliances. So before you attempt to buff out a scratch in your fridge or sink, be sure to check with the appliance’s manufacturer to verify which type of stainless steel you’re working with. One piece of advice is universal — always rub or buff the scratch with the grain of the metal. If you go against the grain of the steel, you’ll only make the scratch worse! When in doubt, call a professional. Maybe you’ve tried everything, or maybe your scratch is more like a gash. 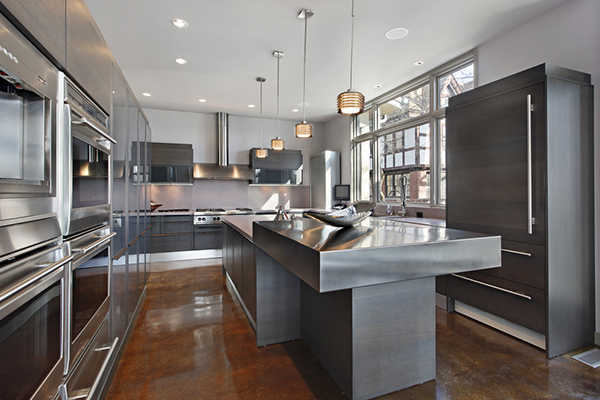 There are professional stainless steel restorers who will come to your home to give you an estimate for repairs. This route will cost the most, but if you’ve tried everything or if it’s too big a job, leave it to the experts.